Arise, shine, for your light has come, and the glory of the Lord rises upon you. See, darkness covers the earth and thick darkness is over the peoples; but the Lord rises upon you and his glory appears over you. Nations will come to your light, and kings to the brightness of your dawn. But when they looked up, they saw that the stone, which was very large, had been rolled away. As they entered the tomb, they saw a young man dressed in a white robe sitting on the right side, and they were frightened. "Don't be afraid," he said. "You are looking for Jesus the Nazarene, who was crucified. He has risen! He is not here. See the place where they laid him. But go, tell his disciples and Peter, 'He is going ahead of you into Galilee. There you will see him, just as he told you.'" Afterwards Jesus appeared in a different form to two of them while they were walking in the country. These returned and reported it to the rest; but they did not believe them either. After the Lord Jesus had spoken to them, he was taken up into heaven and he sat at the right hand of God. Then the disciples went out and preached everywhere, and the Lord worked with them, and confirmed his word by the signs that accompanied it. The Lord's kingdom is used in both a collective and an individual sense, as well as in a specific sense. The kingdom of the Lord comes collectively when any church on earth is re-established on a new basis. It comes individually when we as individuals are spiritually reborn and become new people. The Lord's kingdom is then being established in us, and we are becoming the church. And it happens in specific instances as often as the goodness that flows from love and faith is at work in us--since this is what the Lord's coming means. So in an individual and specific sense, the Lord's resurrection on the third morning embodies the truth that the Lord rises in our minds every day, and even every single moment, when we have been spiritually reborn. With all the hoopla surrounding the Lord's Passion these days, you would think that the crucifixion of Jesus were the main event--the climax of the Gospel story. And in the most traditional version of Christian theology, it is. From that perspective, the whole reason Jesus came was to be crucified, and pay the penalty for our sins by his death. Never mind that the Bible never actually says that Jesus paid the penalty for our sins! It says some things that sound that way to some people. But if that is what the Bible means, why doesn't it come right out and say so? But an even more basic problem with this heavy focus on the crucifixion is that the crucifixion and passion of the Christ is not, in fact, the main event and climax of the Gospel story. And whatever the doctrines of various Christian churches may say, the Christian world as a whole recognizes this fact in the way it celebrates the religious festivals of Holy Week. The main event of our celebrations is not Good Friday, but Easter Sunday. It is not the passion, but the resurrection of the Christ that is the climax of the story. The focal point of the Gospels is not the fact that Jesus Christ died, but the fact that he overcame death. If the main reason Christ came were to die, there would be no need for a resurrection. If the primary purpose were to pay for our sins through his suffering and death, the Gospel stories could have ended after the crucifixion, and there would be nothing essential missing. In fact, in the most radical form of traditional Christian theology, even the life and teachings of Jesus become almost like filler to get us to the crucifixion, and to make sure we appreciate Christ's passion and death sufficiently. Though it may be having a bit of a heyday right now, I believe that this old Christian theology, with its focus on Christ's death, is on the wane. A few hundred years ago, Christ's death was the focal point of nearly all of the Christian churches. Today, many are moving away from this fixation on Christ's death, and putting much more emphasis on his life and teachings, and on his resurrection. I believe that in this new Christian era, the Lord is renewing Christianity. The Lord is gradually, yet inexorably pulling the Christian world out of its focus on death, and moving its focus over to life. More and more as the decades go by, the Christian world as a whole is choosing life over death. The Christian Church is moving out of the thick darkness of a materialistic and medieval theology into the glorious dawning of a new spiritual era centered on resurrection, light, and life. And what better time than Easter to celebrate this new life in the church? This is the day when the whole Christian world celebrates the real climax of the Gospel story. This is the day when we celebrate the Lord's victory over death. 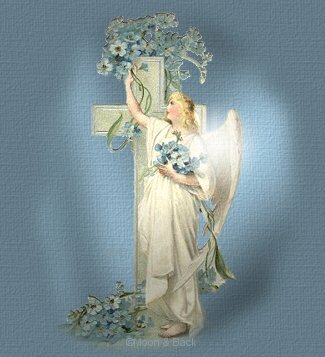 This is the day when we celebrate the wonderful news brought by the angel at the Lord's tomb: "He is not here; he has risen!" If there had been no resurrection, there would be no Christian Church. If the bare requirements of traditional Christian theology were met, and Jesus died on the cross without any resurrection, the scattered and disheartened Apostles would have gone back to their fishing and tax collecting, and there would have been no Gospels. We would not even know that a man named Jesus Christ ever existed. And there would be no reason for both the scholarly and the religious world to sift through every scrap of testimony and evidence to piece together the events of an obscure Jewish teacher who lived during the ancient Roman occupation of Palestine. If Jesus' death had been the end of the story, it would, indeed, have been the end of the story, because the story never would have been told in the first place. But it was not the end of the story. Nor was it just an add-on to make sure that the story of the crucifixion got told. The resurrection of the Christ is our salvation every bit as much as the passion of the Christ is. We are saved not only through the death of Jesus Christ, but through his entire life, his death, and his resurrection. And it is when the resurrection happens in us that we are truly saved. From our church's perspective, the main source of the error in traditional Christian theology is that it focuses on the outward, material events rather than on their spiritual meaning. As an outward, material event, both the crucifixion and the resurrection of Christ happened nearly two thousand years ago. And though these events did have a major impact on history, that in itself is more a historical than a spiritual issue. What matters most about the Lord's life, death, and resurrection is how it affects each one of us today in our soul and in our life. In a favorite Easter hymn, we sing, "Jesus Christ is risen today." And that is exactly the point. Yes, Jesus Christ was risen two thousand years ago. But the important thing is not what happened two thousand years ago, but what happens for each one of us, and for all of us together, today! The Lord's resurrection is not a one-time event. When the Lord Jesus rose from death, it did not just provide the inspiration for the beginning of the Christian Church; it provided the divine pattern for an endless, eternal cycle of resurrections and rebirths. The resurrection of the Christ is not just something that happened two thousand years ago. It is something that can happen for us every year, every day, and even every moment. Even materially, we human beings are continually being resurrected. Every seven years, the entire substance of our body is replaced, and we have a new physical body. Every year we emerge from the death of winter to the life of spring. Every morning we awake from the unconsciousness of sleep to the conscious wakefulness of a new day. Yet the greatest resurrection is spiritual, not material. The greatest resurrection is not the one that Jesus accomplished in Bible times. Rather, it is the resurrection that he continually accomplishes both in the church as a body and in each person who follows the way of the spirit. The greatest resurrection is not the continual cycle of coming around to a new spring or waking up to another day; it is the inner cycle that happens each time our spirit wakes up from the sleep of spiritual death to the joy of new spiritual life. The resurrection of the Christ moves onward in eternal, spiritual cycles. Those cycles are not outside us, but within us--if we open our hearts to the Lord. Jesus Christ is risen today every time we turn away from the death of our old material desires and habits to a new spiritual life of radiating God's light and love to everyone around us. Out of the darkness and death in our own souls, the Lord rises in glory and splendor, renewing us from the inside out. This is the eternal resurrection, the eternal dawning of the Christ. Amen.